The eminent historian, Hugh Anderson, died on 3 March 2017 at the age of 90. He leaves us with an enduring legacy, a prodigious body of work, and his collection of materials which led to the creation of the Radical Collection at Victoria University. 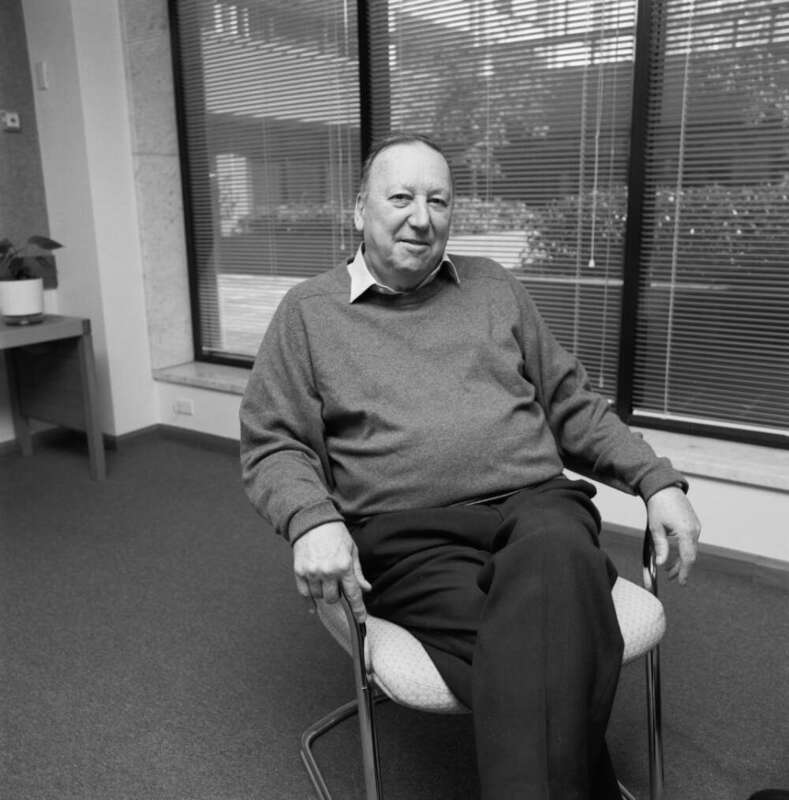 A public celebration of his life was held at University House, University of Melbourne on 23 March 2017, at which Frank Bongiorno offered this tribute. The departmental report on Hugh McDonald Anderson’s teaching is, year after year, glowing in its praise for his capacity, performance and achievement, but there is one early entry – for 1947 – that particularly caught my eye. Anderson, it said, is ‘a strong individualist’. As a scholar, Hugh had the ability, industry and confidence to steer his own course. He did not isolate himself from other scholars, but neither did he allow himself to be blown off course by the latest twist or turn in academic fashion. The result is a body of writing famously formidable in quantity, but also in its originality, variety and quality. He established an enviable reputation as an authority on convict broadsides and colonial ballads, on Victorian gold rush history, and on Australian literature. Hugh deserves to be considered a pioneering Australian social and cultural historian, alongside his better recognised achievements as a major folklorist. He was a highly creative historian who could build, on the story of the tragic fate of an Aboriginal gumleaf musician whom he had noticed in the streets of 1950s Melbourne, a larger story about the role of Indigenous people in making Australian folk culture. Neither a humble Sydney street poet such as Paddy Collins, nor a bush-worker, poet, song-writer and musician such as Simon McDonald, should be overlooked. Their stories were as worthy of telling as those of better-known Australians such as John Pascoe Fawkner, another of Hugh’s subjects. To separate Hugh’s work as an historian from his work on Australian folklore is inevitably an artificial business since, as Graham Seal says, Hugh pursued an historical approach to folklore that was also followed by Russel Ward and Edgar Waters, among others. When Hugh studied broadsides and folksongs, he invariably began with the milieu that had shaped their creation. It was an approach he extended to his consideration of literature more generally. At a time when literary scholars in the universities were moving towards the close reading of texts and, eventually, to critical theory, Hugh’s approach remained determinedly historical and biographical, but never antiquarian or hagiographical. He understood that if you wanted to write literary history, you needed to study the written word, but that there was also something to be said for going to the horse’s mouth. He formed friendships with leading Australian writers such as E.J. Brady, Bernard O’Dowd and Eleanor Dark, and he wrote with insight on many of them. When Warwick asked me to talk about Hugh as a historian, I naturally went straight to my own bookshelves to remind myself of his work. I found sixteen items; it is sobering when you consider that this considerable collection of books and booklets – which left a gaping hole on my shelf that threatened chaos among the books left behind – represents just a fraction of Hugh’s oeuvre. But among those books, I found biographies of Charles Thatcher, Bernard O’Dowd and John Shaw Neilson, the latter written with Les Blake. I own Hugh’s anthology of Louis Esson’s writings, as well as his collection of articles on federation from the Tocsin, a Victorian socialist newspaper. There was a local history of Ripon Shire, and a little illustrated book on Martin Sharp’s Oz tapestry in the State Library of New South Wales. There were, of course, books reflecting Hugh’s lifelong interest in ballads and broadsides, such as his Farewell to Old England: A Broadside History of Early Australia published in 1964 and dedicated to Marcia. I picked that one up from a second-hand bookshop in the Barossa Valley on my honeymoon. The book’s opening is so brilliantly composed; you can immediately see, hear and smell the streets of Victorian London, and I was reminded of the ‘Who Will Buy?’ scene in the stage-musical Oliver!, a comparison that this historian of popular song might have appreciated. And, of course, there is his monumental Farewell to Judges & Juries: The Broadside Ballad and Convict Transportation to Australia 1788-1868. I have copy number 84, signed by the author. There was also Hugh’s biography of Squizzy Taylor, published as Larrikin Crook in 1971, republished in 1981, and given a new lease of life by the Underbelly television series, with a further edition in 2011. If you need a hint of what drove Hugh as a historian, or of just how well he wrote, of his ability to evoke personality, time and place, of his diligence as a researcher, of his intellectual discipline as a committed cultural nationalist, author and scholar, you could do far worse than track down the most recent edition of this book. ‘In the early years of black and white television in Melbourne’, Hugh explained in 2011, ‘we watched many crime files, including The Untouchables, set in the 1920s and 30s. I remember asking with a nationalistic fervour: if we want crooks, why not Australian ones?’ Hugh shows that Squizzy Taylor was indeed a ghastly crook, and while capturing his celebrity and charisma, he resisted romanticising him. But the urge to tell Australian stories, in an Australian way – without gum-nut parochialism but rather the ‘relaxed erectness of carriage’ that Arthur Phillips offered as an alternative to the cultural cringe – was always there. Hugh wrote too many books and articles even to hint at in these few minutes, including more than a dozen entries for the Australian Dictionary of Biography stretching over forty-plus years. He achieved much of this while working as a school-teacher. Hugh did not enjoy the advantages of an academic post; he wrote in time snatched from an already busy life. It would be fair to say that Hugh sometimes reminded those of us who did have these advantages of how much they should be cherished, but in my experience this message was never delivered with conceit, bitterness or rancour. The sub-text was rather that one should not squander the opportunities on offer. Of course, Hugh would pretend to be appalled at the very good wicket that younger historians seemed to be batting on, the implied comparison being the more treacherous twenty-two yards that he had negotiated during his career. And Warwick was inevitably in Hugh’s sights when he was on this theme but in view of his own life as a scholar, Hugh was also in an unusually strong position to appreciate the magnitude of his son’s achievements as a leading international historian of race, science and medicine. Hugh was obviously very proud of Warwick. Finally, in considering Hugh as a historian, there is Dawn. It was fitting that when the journal Australian Folklore presented an issue to mark Hugh’s eightieth birthday, it was dedicated not to Hugh alone but to Hugh and Dawn. These two were a power couple long before anyone had started using that term. Dawn has had a distinguished career as a teacher, educationist, author and editor in her own right, but she was also a collaborator with Hugh, a mate in the distinctively Australian sense of that word, and a fellow-traveller on many journeys – a point, incidentally, that ASIO’s busy cold war spies managed to pick up. In my conversations with Dawn, she’s sometimes recalled that I once gave Hugh a draft article of mine to comment on. She says that after I had received some frank advice from Hugh about how its quality might be improved, I told her: ‘I’m glad he wasn’t my PhD supervisor!’ But I suspect Hugh would have been as successful in that role as he was in the other things to which he turned his hand. What I admire most of all in Hugh is the ingenuity and creativity that he brought to crafting his own career. I can’t think of another Australian historian – or indeed, another scholar of any kind – whose career resembles Hugh’s in the slightest. It took a while, but the academic establishment eventually woke up to the magnitude of this achievement quite late in Hugh’s life – finally sending his way the formal honours he deserved – even as so many of us had relied for decades on his skill, industry and insight. This fine historian never really ceased being a teacher. Frank Bongiorno is an Australian labour, political and cultural historian, and Professor of History at the Australian National University. Thank you Frank for a fine tribute. I knew Hugh for many years as a Eureka champion, and know that so many scholars were indebted to him for editing and publishing the Eureka parliamentary papers. As a publisher he did great service to Australiana. A few years ago he re-published his biography his Creswick folklorist Simon McDonald, with a wonderful CD attached. He is another great loss to the ranks of our social historians.